Have you ever wondered why the tax code is a Byzantine mess that requires 72,000 pages of law and regulation? Hopefully you don’t ponder such dark and dreary thoughts, but the answer is that politicians and lobbyists have spent nearly 100 years creating all sorts of loopholes, shelters, deductions, preferences, exemptions, credits, and shelters. Beginning on that dark day in 1913 when the income tax began to plague America. Politicians love this process since they get to control our behavior and (even better) raise campaign cash from interest groups that benefit from industrial policy in the tax code. 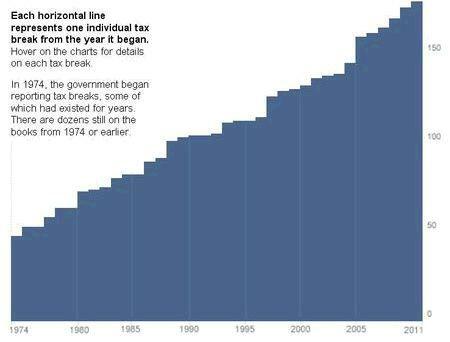 The Washington Post has put together a revealing chart showing the steady growth of tax breaks – just in the past 37 years. If you click on the website, it has some interactive features, but this pictures of ever-rising distortions is all you really need to know. But you should have two warning signs blaring in your head as you peruse this material. 1. You can’t properly define a loophole unless you first properly define an ideal tax system. This sounds like wonky talk for tax geeks, but it’s critically important. There’s a big debate featuring (mostly) tax lawyers on one side who think the right “tax base” includes pervasive double taxation of saving and investment. And the other side is comprised of (mostly) tax economists who think that a proper “tax base” has no double taxation. Not surprisingly, the Washington Post, like much of the Washington crowd, accepts the wrong definition of a loophole. I explained this issue more thoroughly in this post, for those who want to get in the weeds. But here’s one example. If you put money in an IRA, that means you only get taxed on that income one time. The tax lawyers think that’s a loophole and they want you to be taxed at least two times, once when you first earn the money and again when you take the money out of the account. The tax economists point out that the government should only get one bite at the apple, meaning that the income can be taxed before it goes into the account (a Roth-style IRA) or when it comes out of the account (a traditional IRA). But not both. 2. Assuming we have the proper definition of a loophole, we presumably agree that these distortions are both corrupt and inefficient. And we’d like to clean up the tax code by eliminating these provisions. But getting rid of loopholes – assuming that’s all that happens – gives the government more money. That’s what’s motivating folks on the left. Going after loopholes (including things that aren’t loopholes, as explained above) is largely a tax-raising exercise. That’s why, as I explained in an earlier post, any loophole-closing should be accompanied by an equal amount of tax-rate cutting. More specifically, every dollar generated by reducing tax breaks should be used to finance lower tax rates. That’s the underlying principle of tax reform. And if you get rid of all loopholes, eliminate all double taxation, and lower tax rates as much as possible, you wind up with a simple and fair flat tax. This video explains how the system works. But don’t hold your breath waiting for this to happen. Politicians react to the flat tax like vampires react to holy water.